As I mentioned on my post yesterday, here's another SALE and it's actually a huge one because of the famous brands we all love will be all under one roof. I bet that this will cause a traffic in Alabang. Lucky for those companies near the Filinvest Tent as their employees are only arm's length to get the best deals in the south! 1. Use PC / Laptop to register. Some mobile phones are not compatible to our app. 2. Make sure you "LIKE" the page! Go to https://www.facebook.com/TheOFFPRICEShow. 4. Fill up the register online form! Once you are done, you can get your "Free Pass" at the Registration Booth of The Off Price Show during the show dates by simply mentioning your name. Important! Please try to register using your PC or laptops instead of mobile because it is possible that your mobile phones are not compatible with the app we have. Thank you! 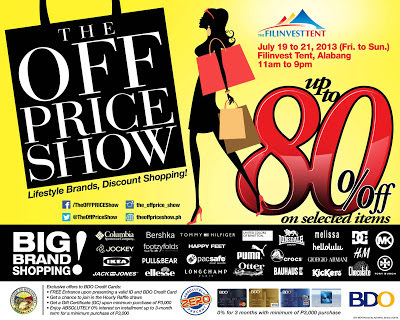 This sale is so tempting but I need to hold my horses as we are saving up for our trip in Bohol in November. Hopefully next year, the same brands will be back and participate in the Off Price Show sale event.